Enjoy luxurious Spa experience with Luxsego high pressure ionic filtration shower head! Impurities in your tap water will often dry your skin and cause an imbalance in your oil glands. With the purifying effect of the bioactive stones our shower heads will help you restore balance. Health benefits may include smoother skin, reduce oil secretion,and increase cell viability. ◐ Q: How to install your shower head? A: 1. Fix your holder on the wall in the bathroom. 2. Connect the Angular of the hose with your holder. 3. Connect the Cone joint of the hose with your shower head. 4. Place and fix your shower head on your holder. 5. If necessary, you can twine the joint with the complimentary Teflon tape. ◐Q: How to replace the beads? A: 1.Hold the shower head and unscrew the sealing cap counterclockwise. 2.Take out the mesh strainer and the mineral beads. 3.Fill the showerhead with 3/4 beads separately. Don't fill it too full. 4.Don't forget the strainers which separate the beads well. ♦We suggest you replacebeads every 2-3 months according to the different water quality. ♦You can search B076TZ5LKH to get"Replacement Mineral Beads"
Filter Your Water Now! Click 'Add to Cart' to Enjoy Luxurious Spa Experience. ▶ SPECIAL MINERAL BALLS - The infrared mineral stone andnegative ion mineral stones make up double filter systemprotecting you reducing chlorine and absorbing harmful substances in the air, softens and purifies shower water to make your skin and hair smoother and softer. 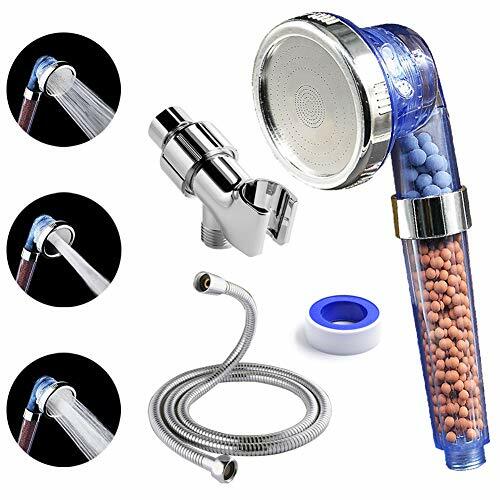 ▶ GENERAL SIZE - Easy to install, general size G1/2'' fits any standard size hose.Without tools and a handyman, allows you to install the shower head as easily and freely as screwing in a bulb by yourself. ▶ THREESPRAYPATTERNS - Rainfall, Jetting, Massage, three shower modes filters shower head to bringyou the bestshower experience in your bathroom. ▶ ECO-FRIENDLY - Save water & highpressurewith steady water flow,up to 30% water saving and 200% water speed increasing beside ordinary showerhead. ▶ SOLIDAND DURABLEDESIGN - Solid build, no leaks. The design of a transparent high-density filter and the perspective are easy to disassemble to clean. If you have any questions about this product by Luxsego, contact us by completing and submitting the form below. If you are looking for a specif part number, please include it with your message.